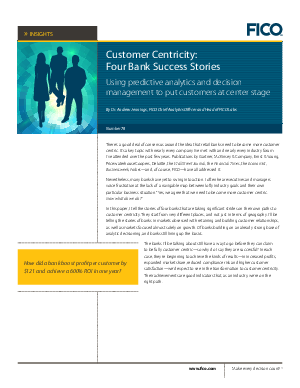 In this paper, I tell the stories of four banks that are taking significant strides on their own paths to customer centricity. They start from very different places, and not just in terms of geography. I’ll be telling the stories of banks in markets obsessed with retaining and building customer relationships, as well as markets focused almost solely on growth. Of banks building on an already strong base of analytic decisioning, and banks still lining up the basics.